Taslan fabric, which is a fabric made of polyester-nylon with a layer of rubber coating. 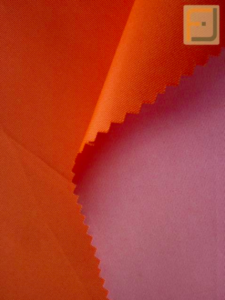 This fabric is not just strong and durable, it is wind resistant and water proof. It is breathable making it comfortable to wear. It is excellent as outer shell for jackets and all types of outdoor clothing.